The Waterpocket Fold is a straight, 100 mile long ridge of tilted and layered rock stretching from the Fishlake Mountains in central Utah to Lake Powell in the south. 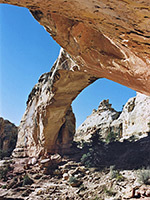 Most is preserved in Capitol Reef National Park, which contains multicolored cliffs, narrow canyons, ridges, arches, spires and domes. The park is so named because of the resemblance of the many whitish Navajo sandstone domes to the US Capitol building; the 'Reef' refers to the high uplifted ridge running north-south along the fold which presented a considerable barrier to early settlers. Capitol Reef National Park is the second largest in the state, yet is much less visited than others in south Utah, partly due to the rather remote location and perhaps because there is no obvious central attraction. 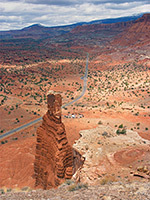 The main road (UT 24) crossing the park east-west gives a flavor of the area and passes close to several of the most famous named features such as Chimney Rock, the deep twisting canyon formed by Sulphur Creek, and Hickman Bridge, a natural arch created by erosion, but it is well worth the national park entry fee to drive the ten mile scenic road which follows the reef itself, starting at the visitor center on UT 24 then south past huge, crumbling, multicolored cliffs with magnificent scenery in all directions. The last few miles are unpaved, and most of the route is narrow and winding so care is needed when driving. 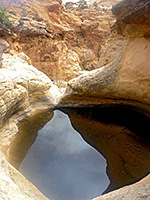 The road ends at the start of a narrow steep-walled canyon (Capitol Gorge) that extends for several miles southwards, and a pleasant foot trail runs along its base and passes some ancient Indian petroglyphs; in total there are over a dozen maintained trails along the park roads. Near the Capitol Reef visitor center is the site of the former Mormon colony of Fruita, established in the 1870s - the good climate of this area and the fertile soil around the Fremont River allowed for successful orchards to be established. The settlers have long since left, departing around the time this area was designated as a national monument in 1937, but fruit is still grown and can be picked in season, for a small fee. Several traditional pioneer dwellings survive and may be visited free of charge. Other attractions along UT 24 include several petroglyph panels near the Hickman Bridge trailhead, a historic cabin, and a powerful waterfall along the Fremont River (formed when the river was rerouted due to road construction in 1962), though access to this has been restricted following several accidents. All other parts of the extensive park backcountry are reached only by cross-country hiking or unpaved roads, the two main routes being Notom-Bullfrog Road and Cathedral Valley Road. Days Inn Torrey has a slightly elevated position towards the east side of town, looking across to the wooded slopes of Boulder Mountain; located in largely undeveloped countryside though next to a gas station, restaurant and Wayne County Information Center. The national park begins 3 miles east, and the junction with Hwy 12 is right opposite.